As the Resource & Referral (R&R) agency in our community, Child Care Coordinating Council of San Mateo County (also known as 4Cs) is here to support parents, providers, and our local community in finding, planning for, paying for, and accessing affordable, quality child care. We also provide referrals to programs and services that support children and families’ needs, including food resources; housing resources; mental health support; legal assistance; and other safety net services. We provide developmental screenings and enhanced child care referrals for children who may have special needs. And we support early caregivers and educators in providing quality early care and education. Our mission is to connect and empower families, educators, and child care providers with resources today for a stronger San Mateo County tomorrow. For over 45 years, 4Cs has been helping to meet the child care needs of parents living and working in San Mateo County. We support licensed child care providers and preschool programs by investing in professional development and improving program quality. Reviewing our annual reports will tell you more about how our work benefits San Mateo County. To help accomplish our goals, the board of directors provides guidance and is responsible for the overall organizational governance consistent with non-profit law in California, 4Cs by-laws, and the mission of the organization. 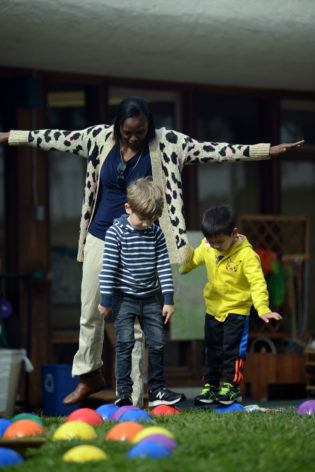 4Cs is staffed by a dedicated team of professionals to support children, families, and the early care and education providers of San Mateo County. Reach a member of the 4Cs team by calling 650-517-1400 or info@sanmateo4cs.org.